Posts Tagged "Vidal Sassoon Artistic Directors"
Home » Posts Tagged "Vidal Sassoon Artistic Directors"
Memories. This is a Creative Board Meeting with the US and Canadian Vidal Sassoon Artistic and Color Directors. 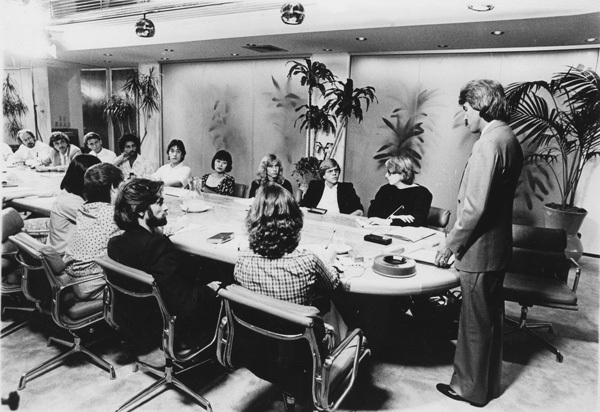 The meeting took place in 1980 at the magnificent Vidal Sassoon Corporate offices in Century City, Los Angeles. Around the table were talents from all the North American salons – Beverly Hills, Chicago, New York, San Francisco, Toronto. Fernando Romero, then President of the Vidal Sassoon US and Canadian Salons is standing at the head of the table. To his left, was Rita, his Executive Assistant. Avram, who worked on many photos on this website, is the man with beard next to her. Unknown is next to him, and John Lee, San Francisco Art Director is next. At the time, I was Creative as well as PR Director for all the US/Canadian Salons and I am to the right of Fernando Romero. Next to me is, I think, Gary, who made videos, then Paul Thomas of the Beverly Hills Salon, who was doing the hair of Goldie Hawn at the time. Next to him was Miwa of the New York Salon, then Sukki Art Director, LA with Kaz, Color, LA. Next is Steven Docherty then of the Chicago Salon (who recommended me to John Sahag) and next to him is Graham Wren, International Artistic Director, who did most of the hair for most of my collections during my 2 year period at Vidal Sassoon (1979-1981.) John K. of Chicago is at the other end of the table. Also present, but not photographed here were Helen Chudoba, Toronto Artistic Director … Vernon Keach, NY Artistic Director, Edward Moore, Color New York … Feary Bina, Color Toronto … Greg Miller, Color Chicago. I can’t for the life of me remember what exactly was discussed but I think it was some talent there and some meeting.